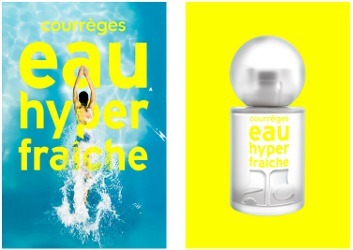 French fashion house Courrèges has launched Eau Hyper Fraîche, a new 'ultrafresh' aromatic fragrance. Eau Hyper Fraîche was developed by perfumer Fabrice Pellegrin. The notes include bergamot, mandarin, citrus, petitgrain, mint, jasmine, oak, patchouli and moss. Courrèges Eau Hyper Fraîche is available in in 50 or 90 ml Eau de Toilette. What a disconnect between the notes and the name/packaging! Starts off where I expected, and then veers. For this one I expected grapefruit, mandarin, mint, ozone, and musk. I have probably already given this about 10 times more thought than it warrants! Given that the oak is probably a smidgen and the patch is almost certainly a tiny little molecular fraction, it’s probably exactly what the name says! And you know there’s musk because there’s always musk, and there could be ozone or calone as well, who knows. Sounds good. Courreges actually did an amazing job with Empriente’s reformulation. Maybe this one would be a cheap thrill. Good to know. Not sure I have ever smelled a single Courreges fragrance, ever. I actually really love the graphics for this – both the ad and the bottle. It’s making me flashback to my first (at about age 8) perfume obsession – Love’s Fresh Lemon. If it had come out in 2017 instead of 1970-whatever, this would be a very fitting campaign. Yes — agree on the graphics / bottle design.